If you've ever tried slogging through knee-deep snow, you know that snowshoes aren't a convenience so much as a necessity in terms of traveling through the snow. The ingenius footwear simply spreads your weight across a much larger surface area, allowing you to walk across the surface without sinking straight down. While snowshoes provide a huge boost for walking or hiking in the snow, they are typically large, rigid devices. And since winter hiking rarely involves walking only on one surface type, snowshoers often have to take their shoes off and either carry them or strap them to their backs. Neither option is ideal and the world has been waiting for a better solution. I've been testing out a pair of foldable prototypes for a few months. These help to make snowshoes more compact, but are still relatively large and bulky. But at least you can shove them inside of a backpack. 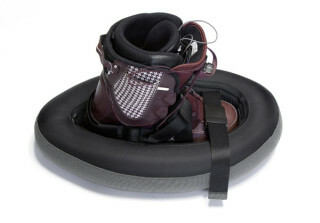 And here we have a new take on collapsible snowshoes: AnyExit Small Foot inflatable snowshoes. These shoes are a pretty simple innovation really: deflate them and pack them up for minimal size and weight when you don't need them and inflate a pair of snowshoes when you do. 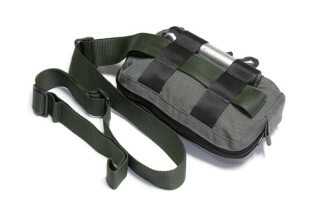 There's an included hand pump that looks similar to a mini bike pump. They look much more portable than the average snowshoe and seem like they'd be a great innovation for snowshoeing in terrain where you're constantly taking your shoes off to hike on packed snow or dry ground. They were designed with backcountry snowboarding in mind, but I could see them being useful for a variety of winter sports. Of course, if you step on a pointy rock or thorn, you may be out of luck when hiking back through the drifts--hopefully they come with an easy-to-use-in-the-cold patch kit. Plus, I don't know how these would actually perform when compared to traditional snowshoes. But they're definitely an interesting twist on the snowshoe and if they float comparably, are certainly lighter and easier to pack. The Small Foot snowshoes will be on display at the Brand New section of the ISPO show in Germany next month.